Brazil: White elephant? Quite the opposite! Both domestically and internationally this stadium was sentenced to a life of empty stands and mediocre event calendar. That’s not the case as Arena Pantanal hosts more than one game a week. Arena Pantanal was one of three stadiums expected to become “white elephants”, monuments of pride with no actual plan of future use. Too large, too expensive and not needed – these arguments were used by critics. But first two months were almost all about football in Cuiaba, maybe except for occasional non-sporting activities. 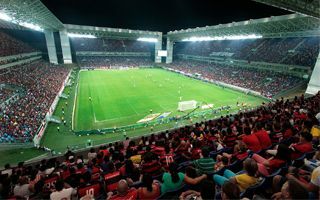 While other stadiums were waiting for re-launch into operation after the World Cup, Arena Pantanal already saw its first post-tournament game within a week. To date there have been 11 football games, more than one per week on average. That’s Mato Grosso state authorities’ way of proving their investment was needed. But the first game wasn’t played by local sides, it was Vasco da Gama against Santa Cruz. First of three showcase games wasn’t a big success, though. 8,856 people came to the game, below the level guaranteeing any profit. Two following fixtures saw a huge increase in turnout as 31,473 people watched the Corinthians – Bragantino encounter and a near-sell-out came last Friday, when Goias took on Flamengo (38,405). As for local teams, there are three treating the new arena as home: Luverdense (Serie B), Cuiaba (Serie C) and Operario (Serie D). Alone none of them is able to provide crowds returning organization costs, so the state offered a plan B: Rodada Dupla or Double Round is a package of two games per day, which reduces the cost to a single event, while encouraging fans to watch two games. So far results are encouraging with each of the three Rodada Duplas seeing turnout of over 14,000. The only game so far with a really low attendance was the fourth league game between Operario and Luziana, attended by 2,504 people. Still, the operation of Arena Pantanal so far can hardly be called disappointing with number of matches lower only than that at the Maracana and… Arena das Dunas, another stadium presumed to be a white elephant after the World Cup.